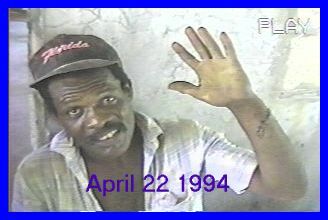 A man by the name Anthony "Pappy" Reed, of Corozal, Belize, came to my house November 26th. 1991 with a very serious burn of the left hand. The injury had occurred four days before, November 22, 1991. His hand was in a serious state of infection. Pus was flowing freely from the open burns which penetrated deep into the palm of his hand. Three fingers were "melted" together at their bases. 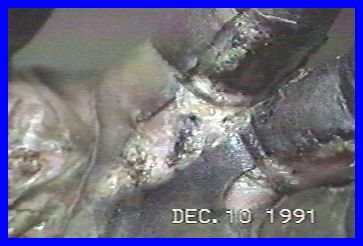 The blacking of the skin surrounding these wounds were a clear indication that Gangrene was starting. He also suffered from a very inflamed arm pit on the same arm. A video tape was made of the ensuing treatment. D. V. C. Awang, Ph.D.; F.C.I.C. ; head of the Bureau of Drug Research; Health Protection Branch; Health and Welfare Canada was present and witnessed the progress of the first two weeks of treatments. After examining the wound I gave the man the following prescription. Three grams of Cascabel powder three times per day; morning, noon, and evening; to be consumed with his meals. No other medicines or treatment was given. No antibiotics, salves, ointments. No skin grafts, indeed, no bandages of any sort. The raw wound with pus flowing was allowed to "breath" freely. The only topical treatment was gently washing with soap. After the first day of treatment the pain in Tony's armpit stopped. 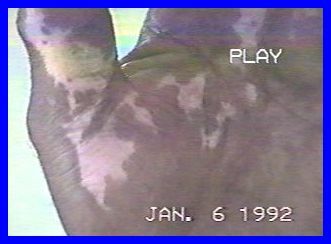 The first video "Pic" shows only one view of the base of the palm. The depth of and the seriousness of the wound is only barely illustrated. This "Pic" shows the base of the palm with the thumb leading to the left. This picture shows more clearly the extent of tissue damage. 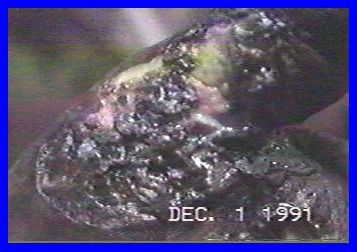 The black coloring of the infection is quite extensive. A thick milk colored fluid is seen exuding from the wounds. The man is feeling fine and is not experiencing pain or discomfort. The pain in his armpit has not returned. 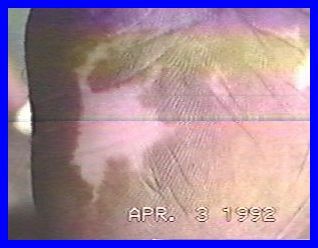 The above "Pic" shows the same view as Nov. 26, 1991 but after three days treatment. This picture shows a very dramatic view of the tissue damage. Pus has stopped flowing. This makes the wounds appear "fresh". It is very clean and can be seen to it's full depth. 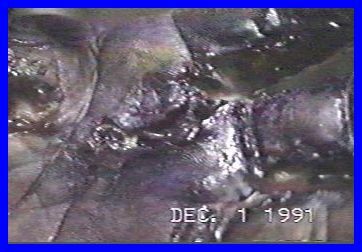 The blacken skin sections, signs of serious infection, reducing in their extent. The wound is of a very "healthy" appearance. Neither pain or discomfort are being experienced by the patient at this time. Same View Dec 1, 1997, after six days of treatment. 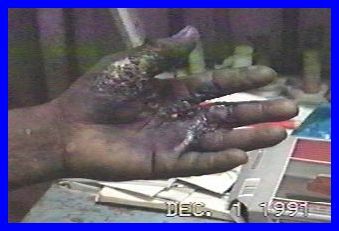 Below, we clearly see the massive damage to the lower webbing between the fingers, all from this same burn incidence. The flesh is not joining the fingers together while healing. Originally all was fused together. The wounds are now healing very quickly. 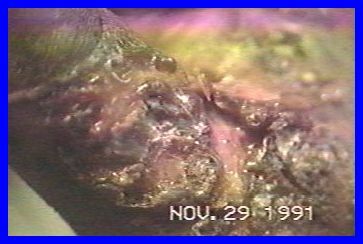 New healthy flesh is growing in the wound cavities which are very clean with absolutely no sign of infection. The black skin is mostly returned to a healthy color. The patient has full use of hand and fingers and is doing light work with his hand. Absolutely no discomfort. It appears as though the hand is regenerating itself. This after 16 days of treatment. The hand is totally recovered. The skin is completely regenerated. there is no scar tissue. Even the original palm lines are back. The hand is totally functional with no weakness in movement. There are no blackened areas left. The newly formed tissue is whiter than the surrounding skin but is beginning to assume the proper natural color. 42 days after beginning a treatment that was 21 days long. At this time Mr. Reed had stopped taking Cascabel for 21 days. On my right hand is a scar from when I burnt the back of my hand at the age of five. The burn was nowhere as serious as Tony's but the scar is still there forty six years later. It is inconceivable that a burn as serious as just witnessed can be healed without leaving a scar in such a short period; yet that is exactly what we witness. The great medical fantasy can be summed up in one word -- "REGENERATION". I believe that Tony's hand regenerated. I believe that regeneration is most probably the traditional form of the human bodies ability to heal but that the matter becomes seriously complicated due to exterior secondary infections which come about during the cure time. These infections can easily complicate the healing process to the point of death for the patient. Cascabel is such a broad spectrum antibiotic that it effectively protected Tony's system from all foreign invaders. This allowed the body to get about its business, namely the regeneration of destroyed tissue, in a rapid and efficient manner. Thus a total cure was achieved in a very short 21 days of time. All of the above text comes from original description of video footage back in 1992. In closing, let me show a few "follow-up" shots. This next "Pic" is April 3, 1992. 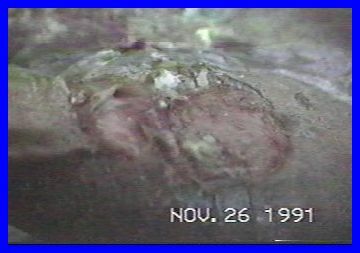 That is 3 months after the Jan. 6, 1992 "Pic". Again, no more Cascabel medication was consumed during this interval. 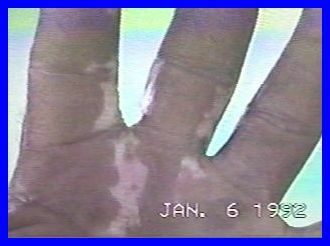 One can't help but notice the extent of regeneration visible here -- even to the exact same pattern of "Palm Prints" that this man was born with!! As always, I try to keep in touch with the patient to make sure that the cure has not reversed. Here is the picture of the man, "Pappy" Reed and his hand, two years later.